Kevan: I don’t know why but I feel like the words smoked avocado and bacon should be added to your near future. Holly: smoked avocado and bacon guacamole times? or a smoked avocado BLT? Holly: what if it’s a smoked avocado, shrimp, spinach and bacon sammich? 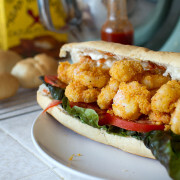 like a fancy po boy! What kind of sauce, though? Kevan: I don’t know what aioli is but use it! And that’s usually how an idea starts – someone (usually Kevan) telling me about a random ingredient. Then bloop, a recipe comes to life! If you love smoky delicious foods but don’t have the space or yard for a full standing smoker, I highly recommend this stovetop smoker . Yes, your house will smell of smoked wood chips, but who doesn’t love that smell? It’s up there with gasoline, matches and cut grass for me. I used apple wood to smoke the avocado, but if you have a favorite wood, by all means, use that. How does a smoked avocado taste? Kind of like avocados and bacon had a baby. A delicious, delicious baby. 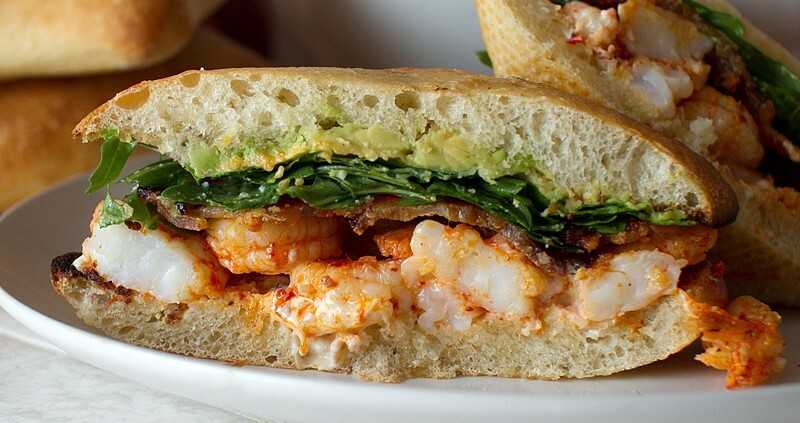 Surprisingly enough, the lemon aioli is what makes this sandwich. 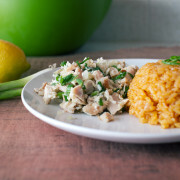 The punch of citrus really brings everything together, so don’t be shy with the lemon juice and the lemon zest! I wanted a hint of spice on the shrimp and I remembered I just purchased some harissa paste but couldn’t figure out what I wanted to do with it. 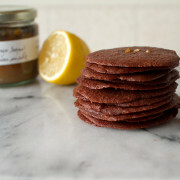 Harissa is a Tunisian pepper paste made with hot chilis, garlic, cumin and olive oil. Specialty markets and places like Whole Foods usually have it in the “ethnic” aisle. If you can’t find harissa, use your favorite combination of spices to season the shrimp (cayenne, cumin, fresh chopped garlic, etc). Let me just shut up so we can make this sandwich. 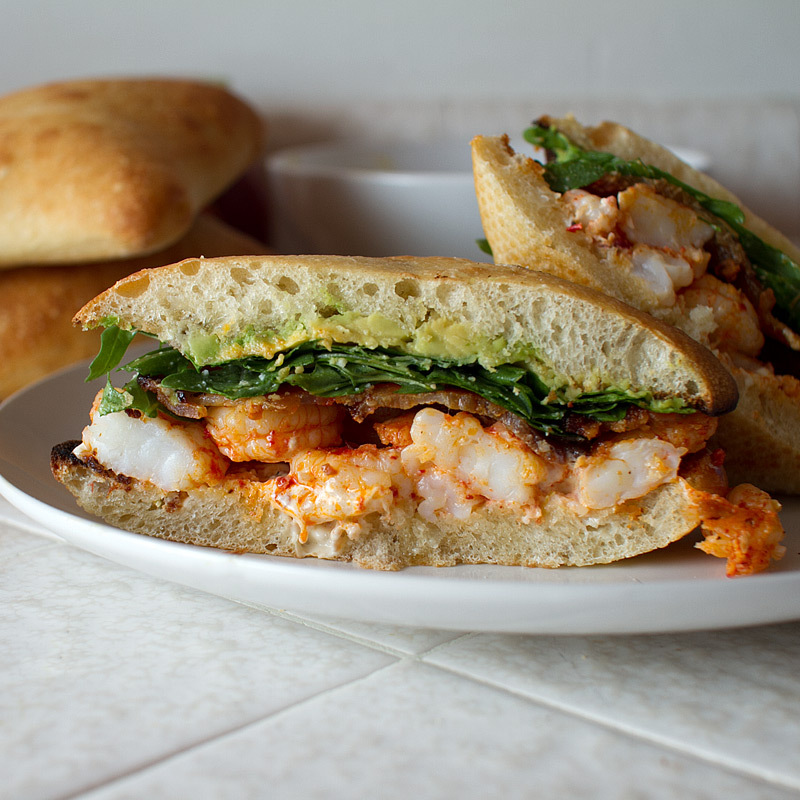 You’ll need olive oil, bacon, arugula, avocados, lemon, harissa and shrimp. I decided to smoke the avocado over apple wood chips. You can use your favorite wood here. 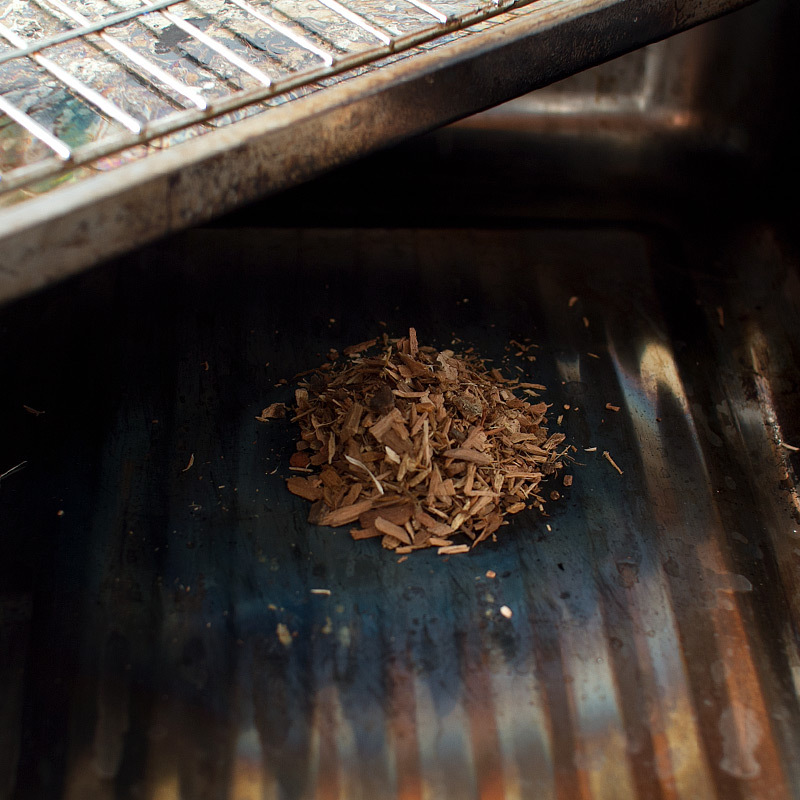 Place the wood chips on the bottom tray of the smoker. As you can see, I use my smoker OFTEN. Split the avocados in half lengthwise. 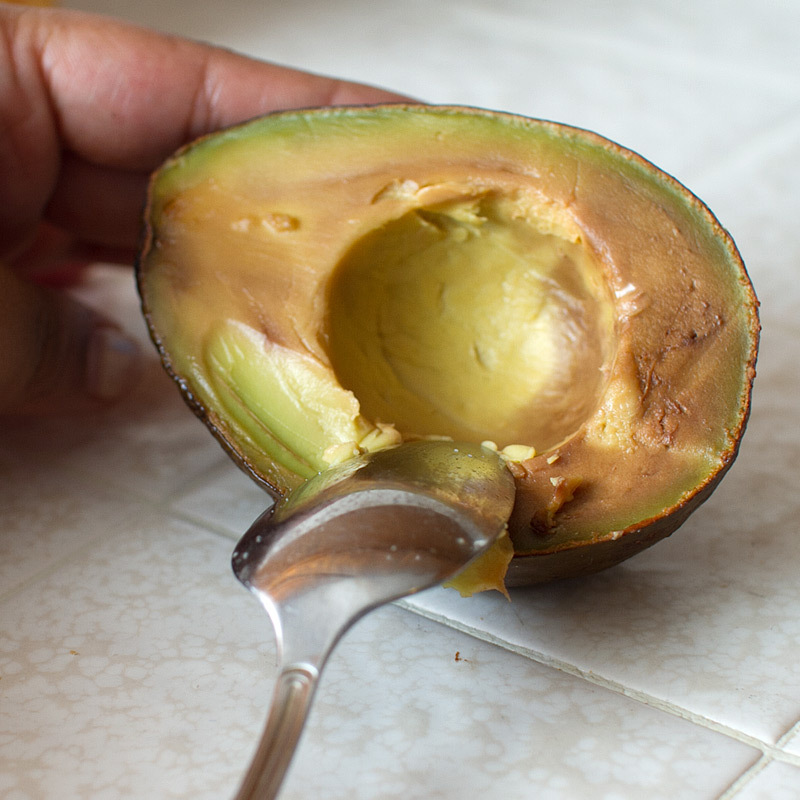 Tiny kitchen tip: Remove the pit by giving it a good whack with a sharp knife, then gently twist the knife to remove the pit from the avocado. 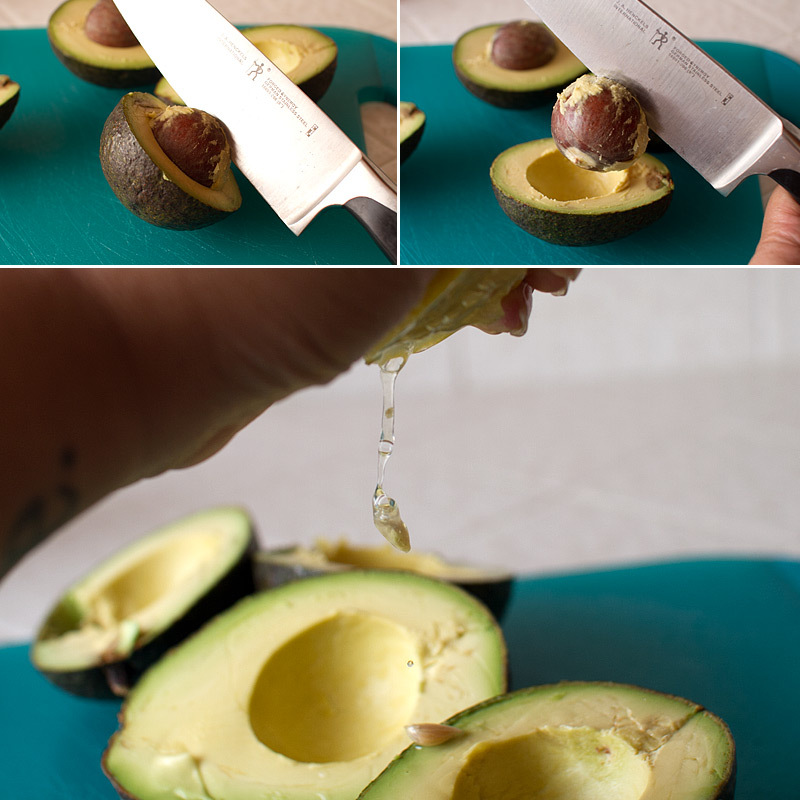 Squeeze lemon juice all over the avocado to prevent browning. Place the avocados on the rack of the smoker. Smoke according to manufacturers instructions over medium-low heat for 30 minutes. 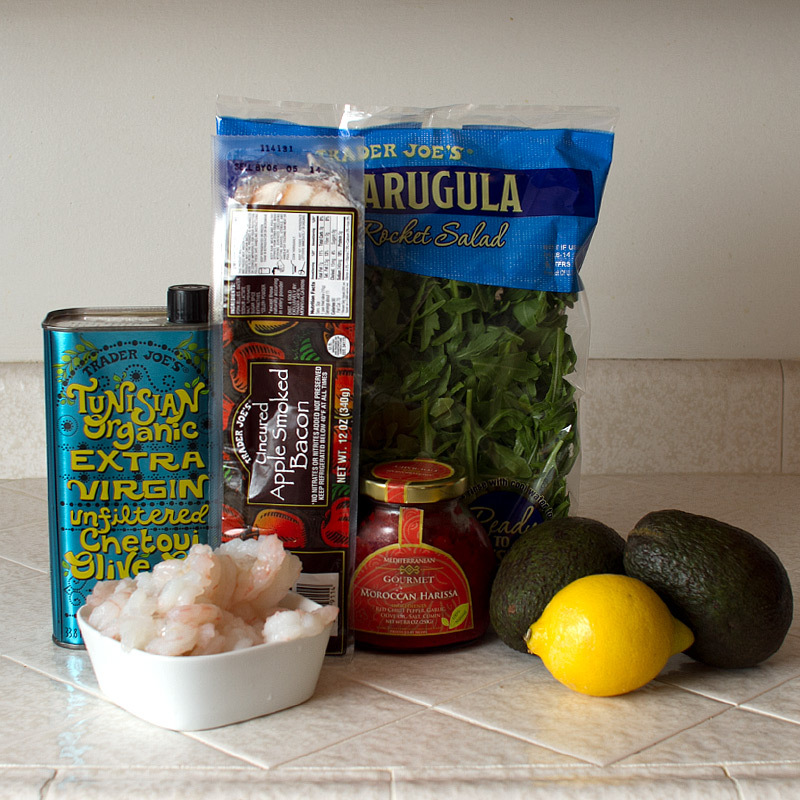 While the avocados are smoking, fry the bacon, make the aioli, dress the arugula salad and cook the shrimp. 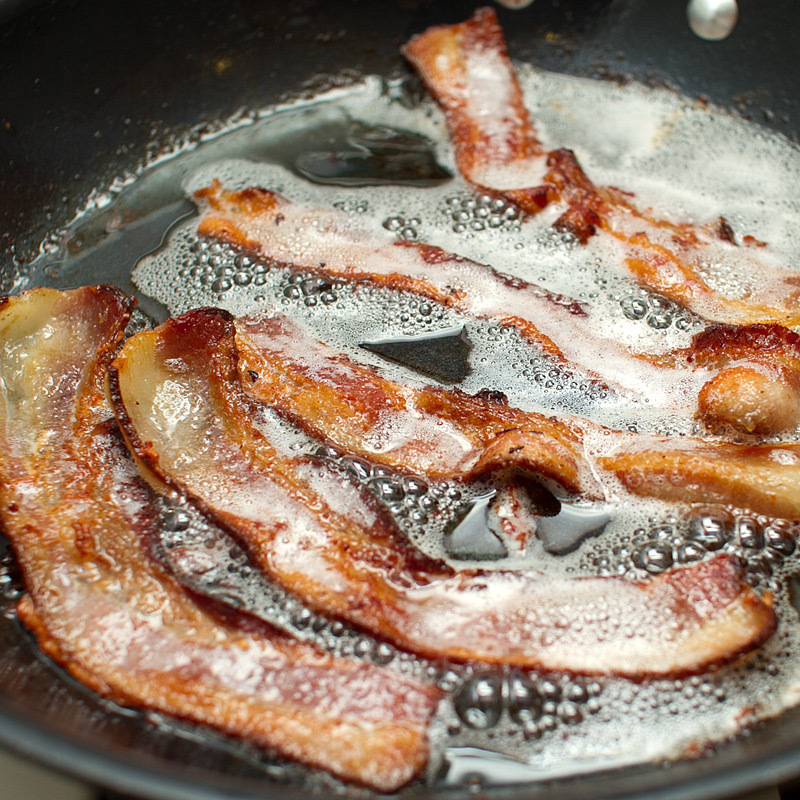 Fry up 8 strips of your favorite bacon – I like Trader Joe’s Applewood smoked bacon. 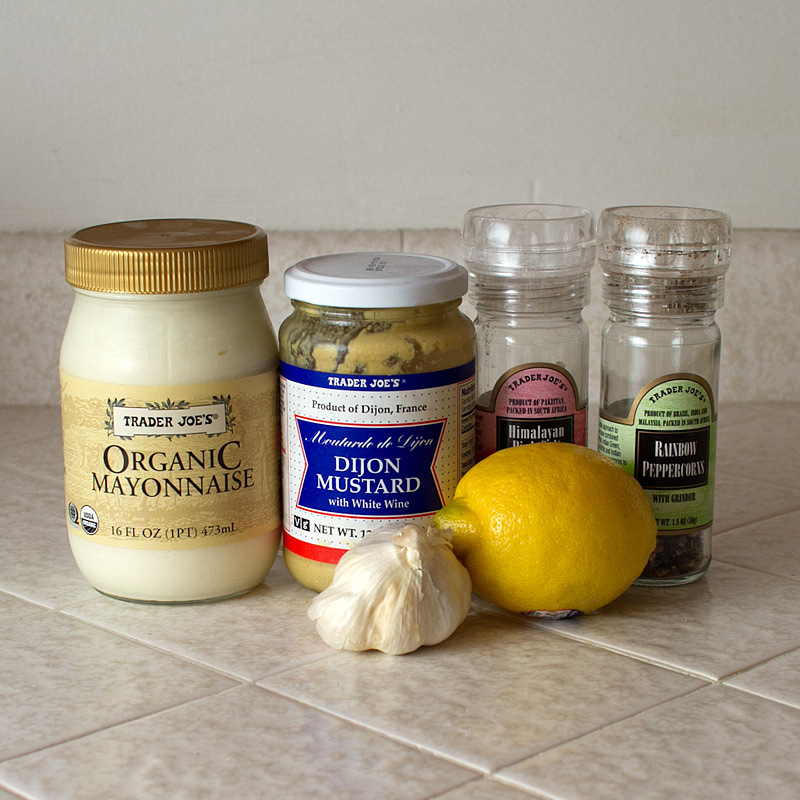 For the aioli, you’ll need mayonnaise, dijon mustard, salt, pepper, lemon and garlic. 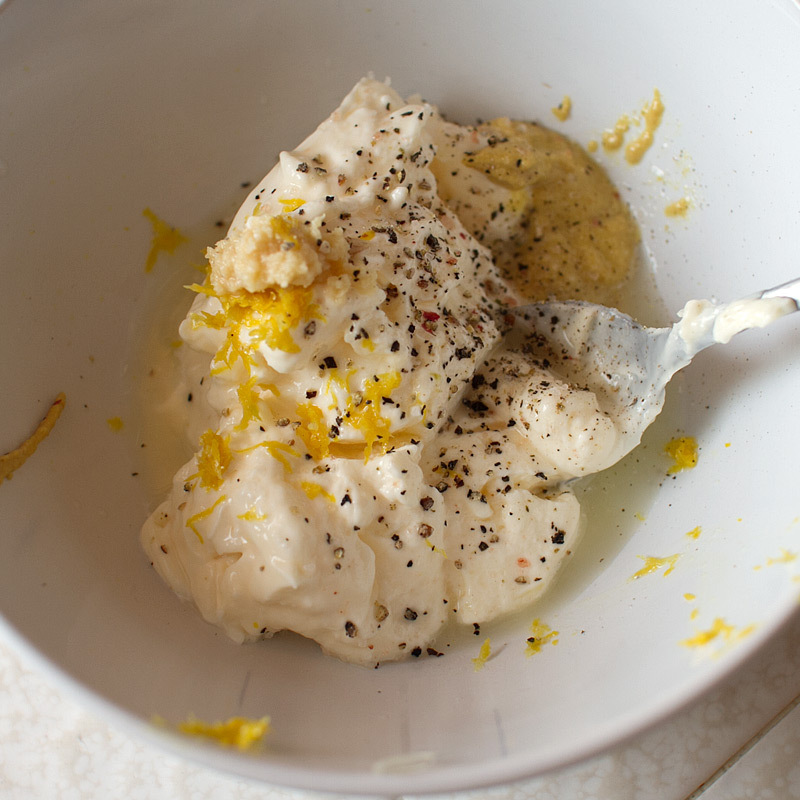 Combine the mayonnaise, dijon and the zest and juice of half a lemon. Taste and adjust seasoning with salt, pepper and additional lemon. 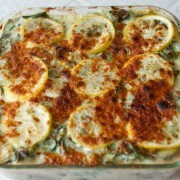 I like things super lemony, so I used the zest and juice of one whole lemon. 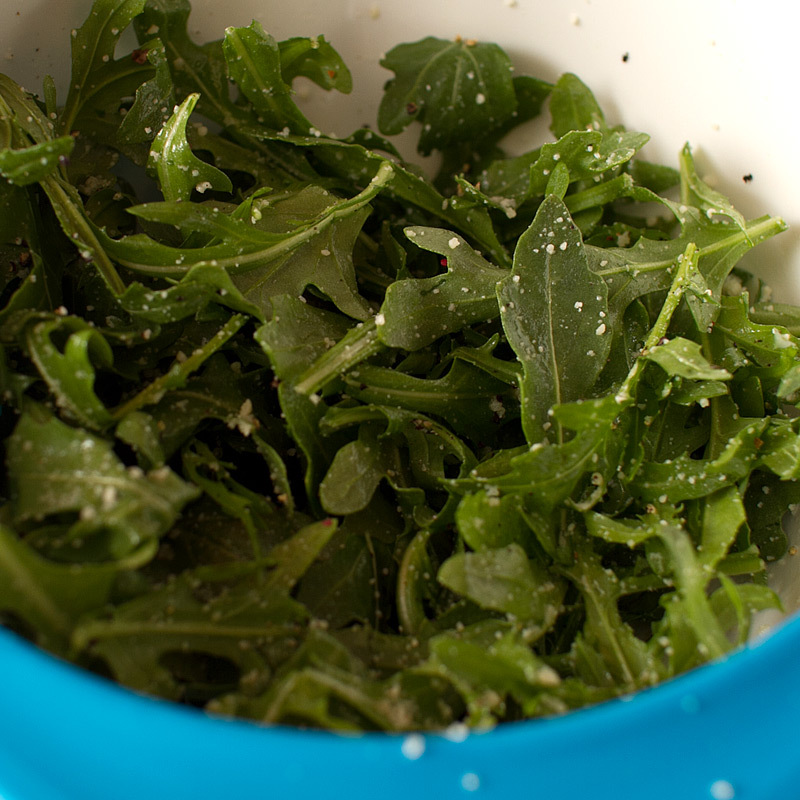 Dress the arugula with olive oil, a squeeze of lemon juice and a sprinkle of parmesan cheese. Taste it. Does it taste good? Adjust seasonings with salt, pepper and/or additional lemon juice. Set aside. 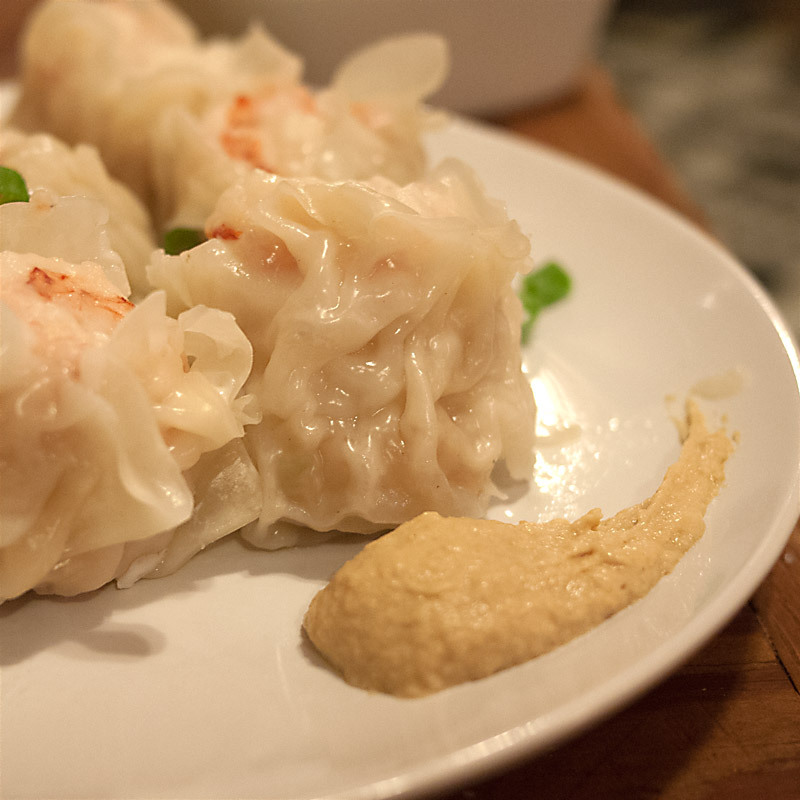 Combine shrimp, harissa paste and olive oil. Heat a grill pan over medium-high heat until very hot, but not smoking. 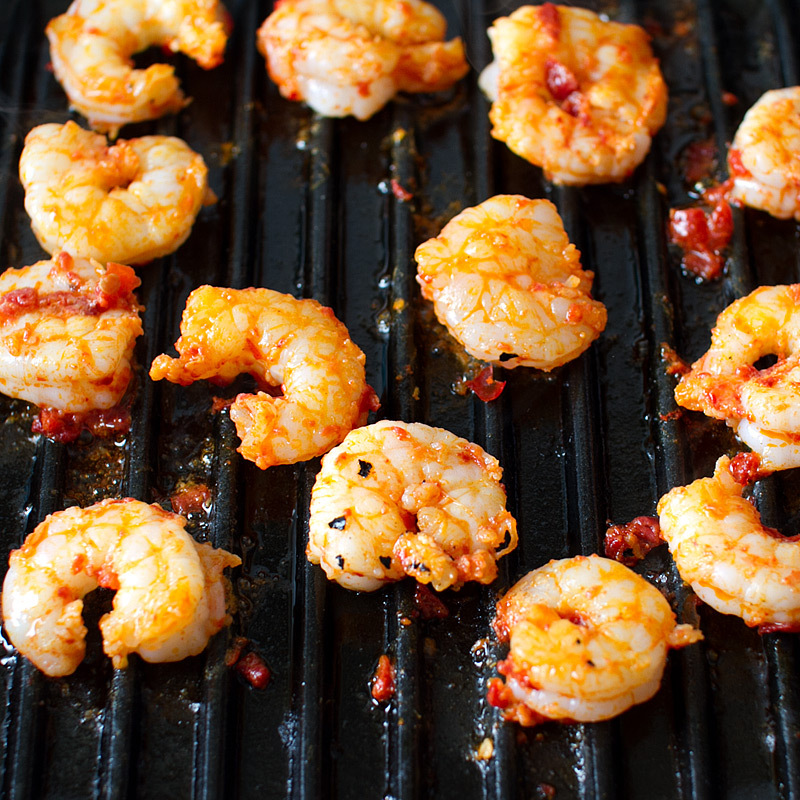 Grill the shrimp just until opaque and cooked through. Set aside. Fresh out of the smoker – there will be SOME browning, but not nearly as much as if we hadn’t squeezed some citrus on there. 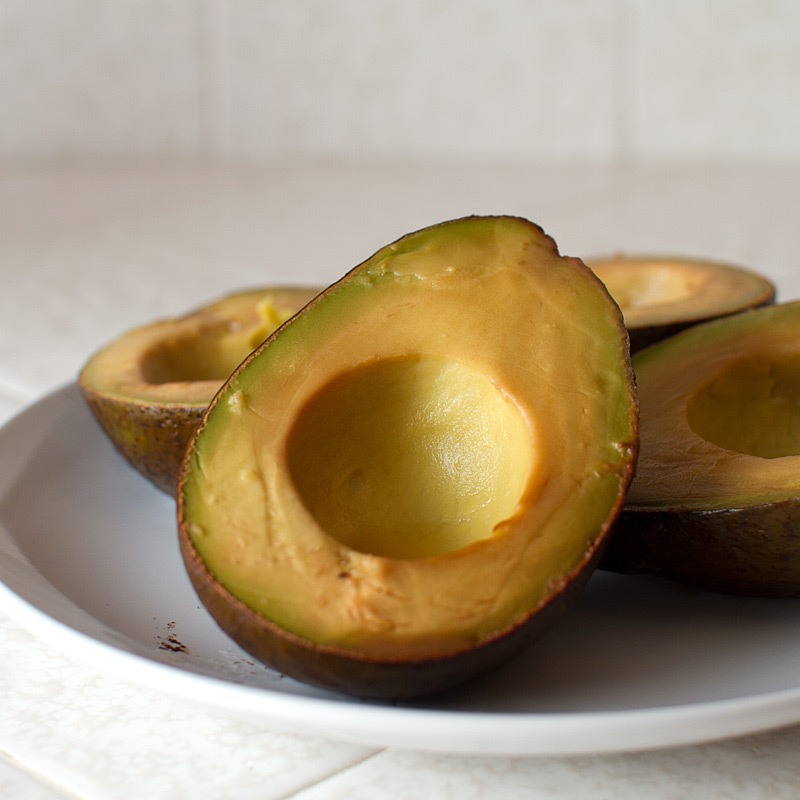 If the “brown” part of the avocado is really off-putting and freaking you out, you can use a spoon to scrape off the thin layer of browning. I don’t mind it at all and left it as-is. And now let’s put it all together. 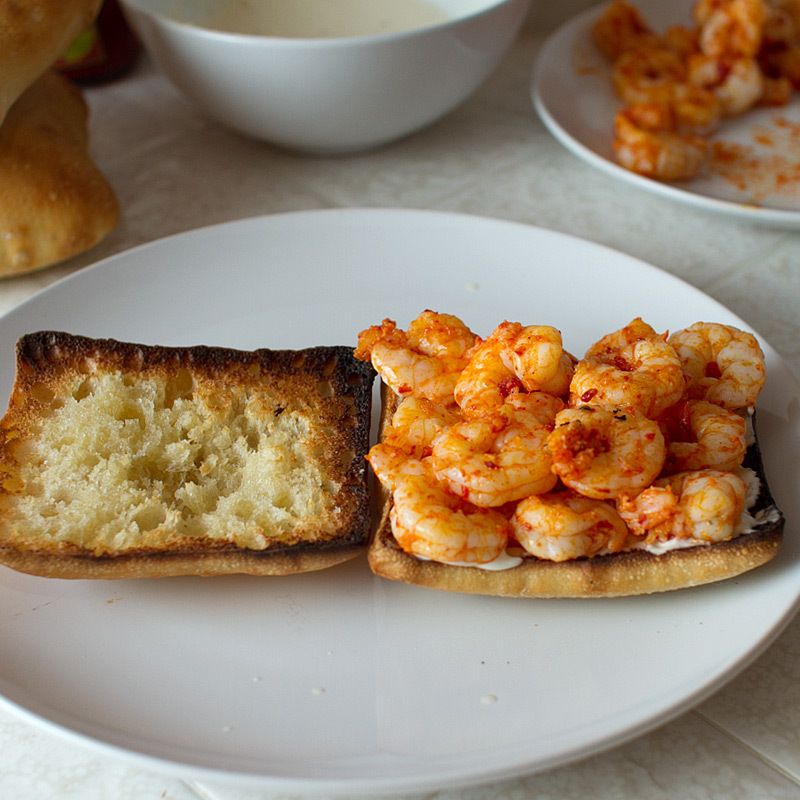 I love cibatta bread, so that’s what I chose for this sandwich. 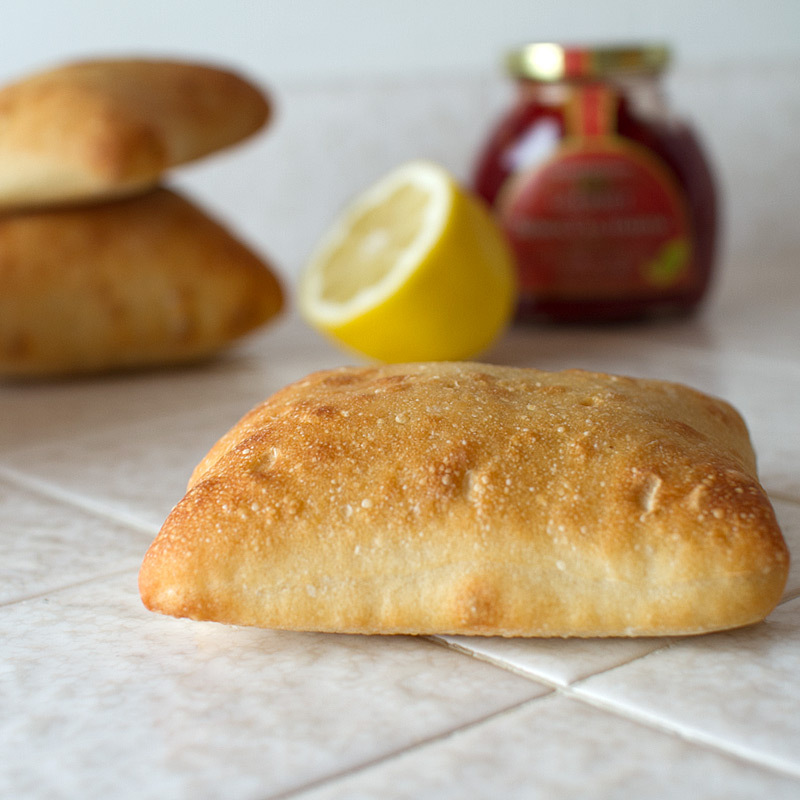 It has a wonderful crust, while the inside is soft and not too dense. It reminds me of an english muffin. Use your favorite sandwich bread or roll. Split the bread lengthwise and spread a little butter over both cut sides. Broil, cut side up, for a few minutes to toast. 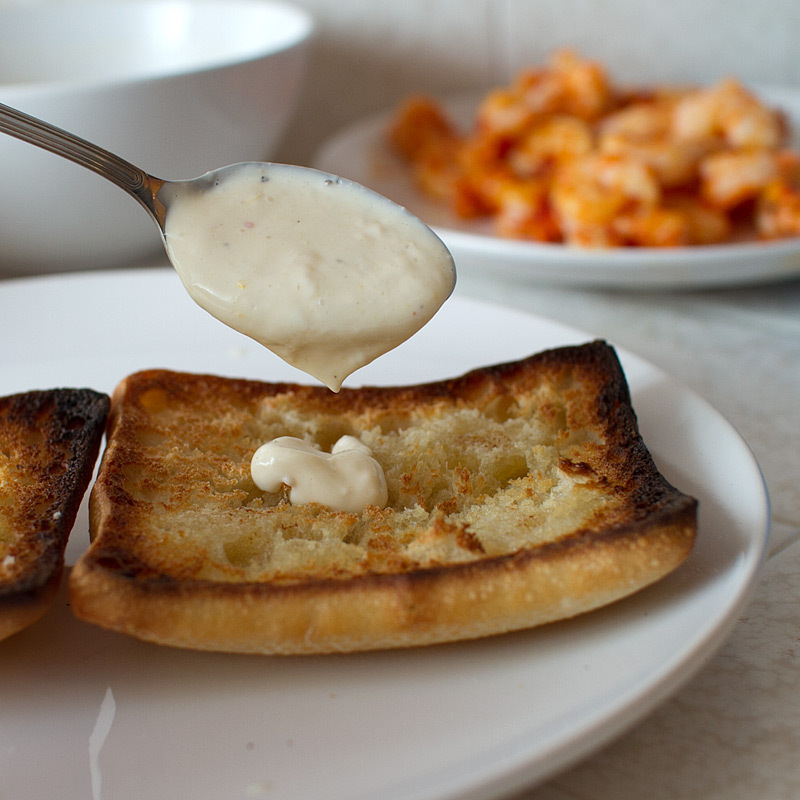 Spoon a generous amount of the aioli on one side of the bread. 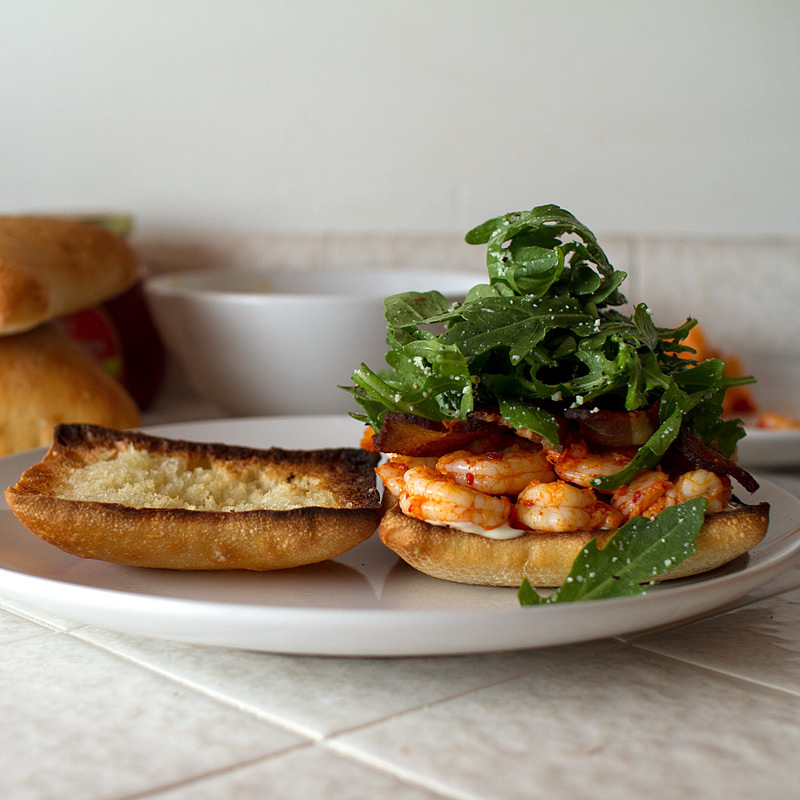 Top the aioli with the harissa shrimp. 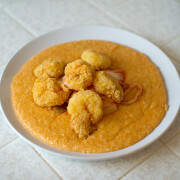 Then, top the shrimp with two slices of bacon. … and then a good handful of the arugula. 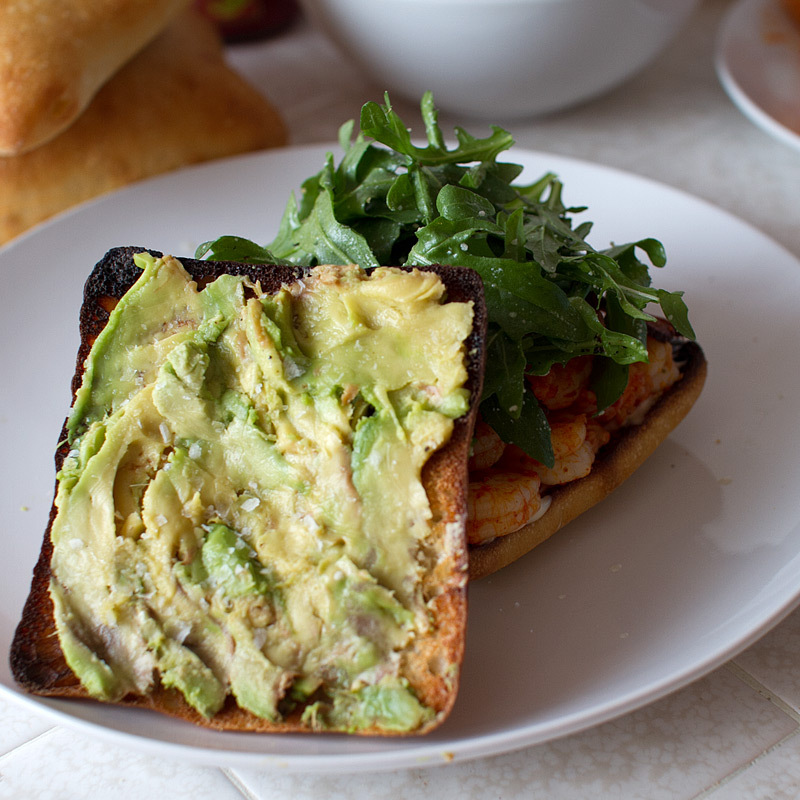 Finally, take 1/4 of the avocado (half of a half) and spread over the other half of the bread. Sprinkle with a little course sea salt. Cut avocados in half lengthwise. 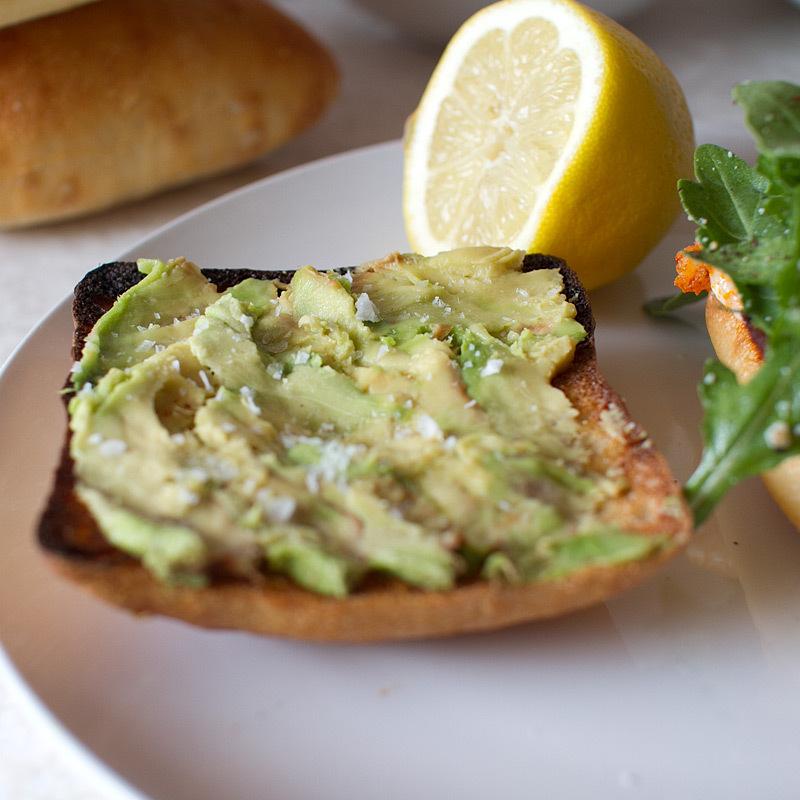 Remove pit and generously squeeze the juice of 1 lemon all over the avocado meat. 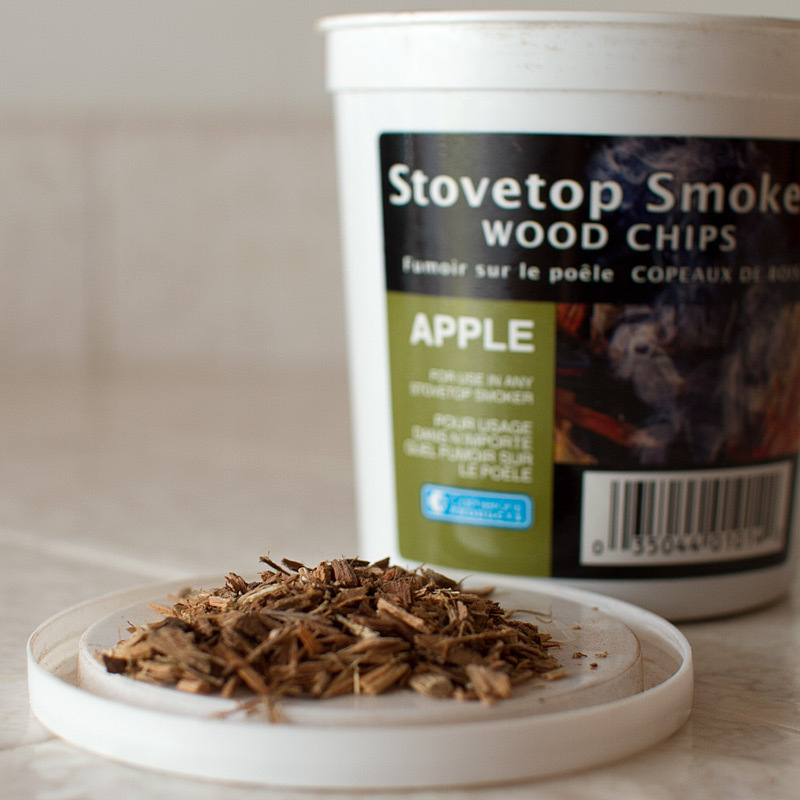 Using 1 1/2 tbsp of apple wood chips, smoke according to your stovetop smoker’s directions for 30 minutes over medium low heat. 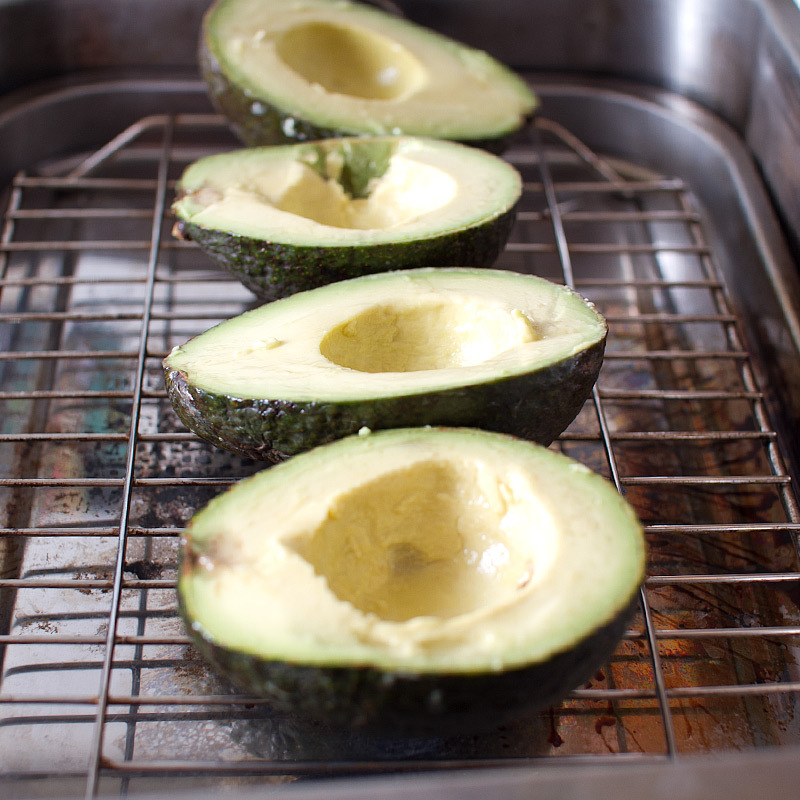 After 30 minutes, remove the avocados from the smoker, rub with a bit more lemon juice and set aside. 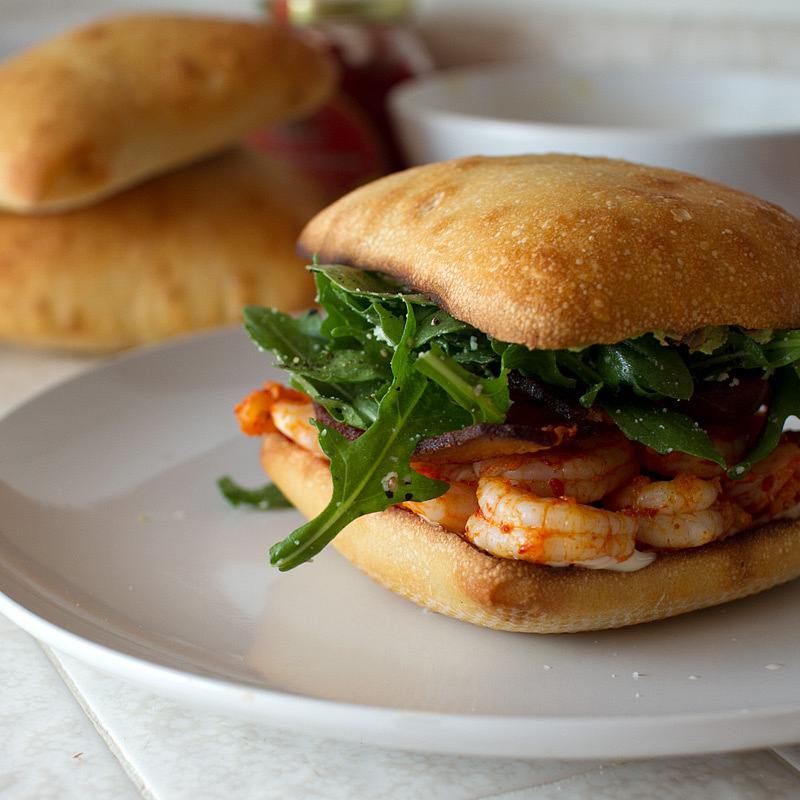 While the avocado is smoking, fry the bacon, make the aioli, dress the arugula and cook the shrimp. 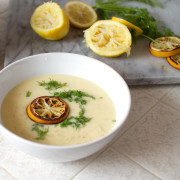 In a small bowl, combine mayonnaise, garlic, dijon and the zest of 1/2 a lemon. Add in the juice of 1/2 the lemon and stir to combine. Taste and adjust seasonings. Because I enjoy sour things, I ended up using the zest of one whole lemon and the juice of one whole lemon. Cover and store in the refrigerator until ready to use. 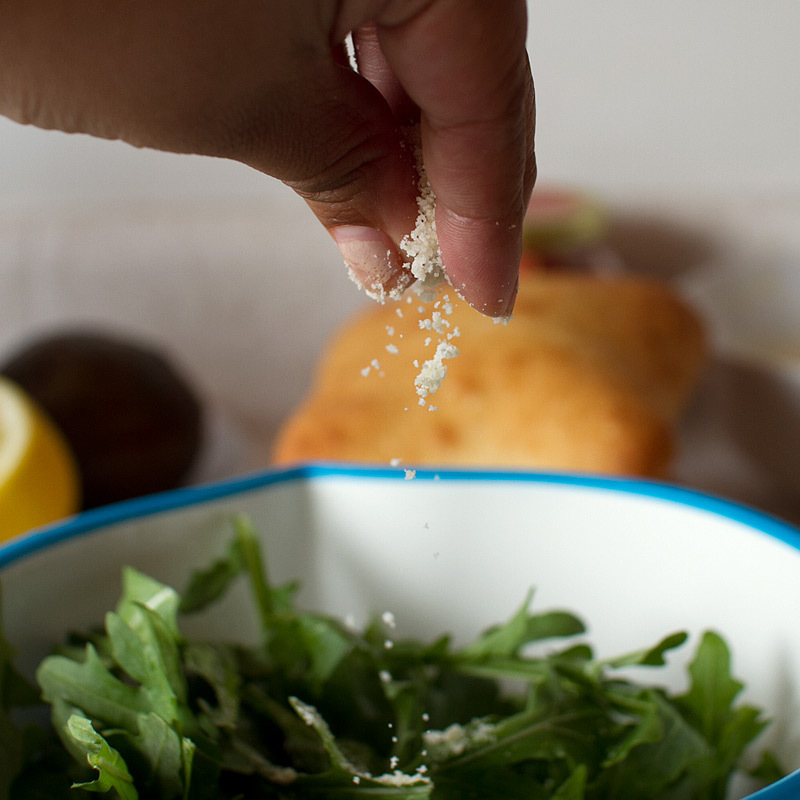 In a medium bowl, toss together arugula, olive oil, a squeeze of lemon juice and 2 tbsp parmesan cheese. Taste and adjust seasoning with additional lemon juice, sea salt and freshly ground pepper. Set aside. 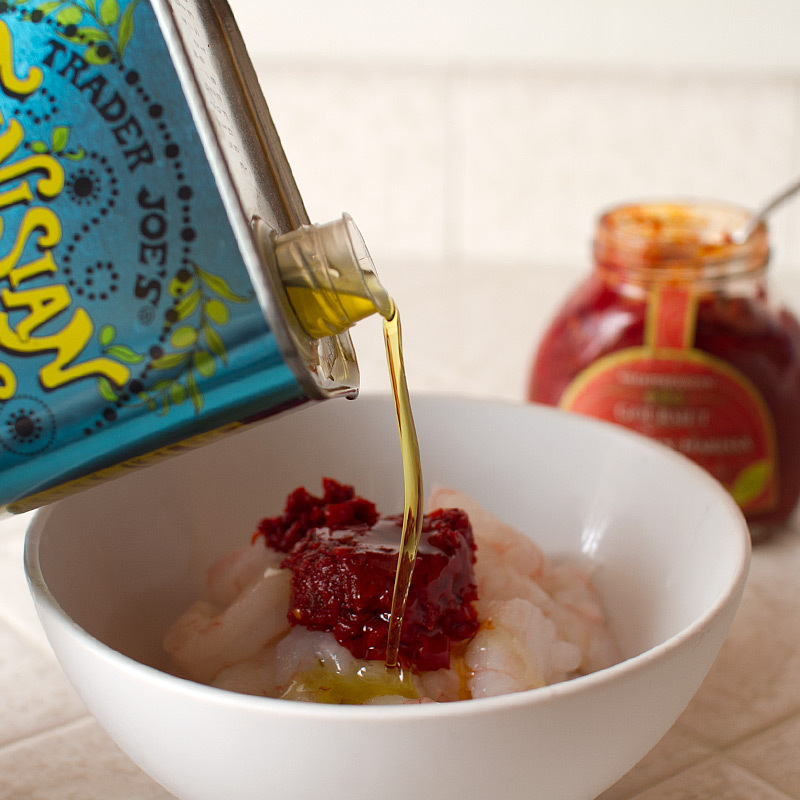 Combine shrimp, 2 tbsp olive oil and harissa. Grill just until no longer opaque. Set aside. Split the bread lengthwise and lightly butter. Broil until toasted, about 3-4 minutes. 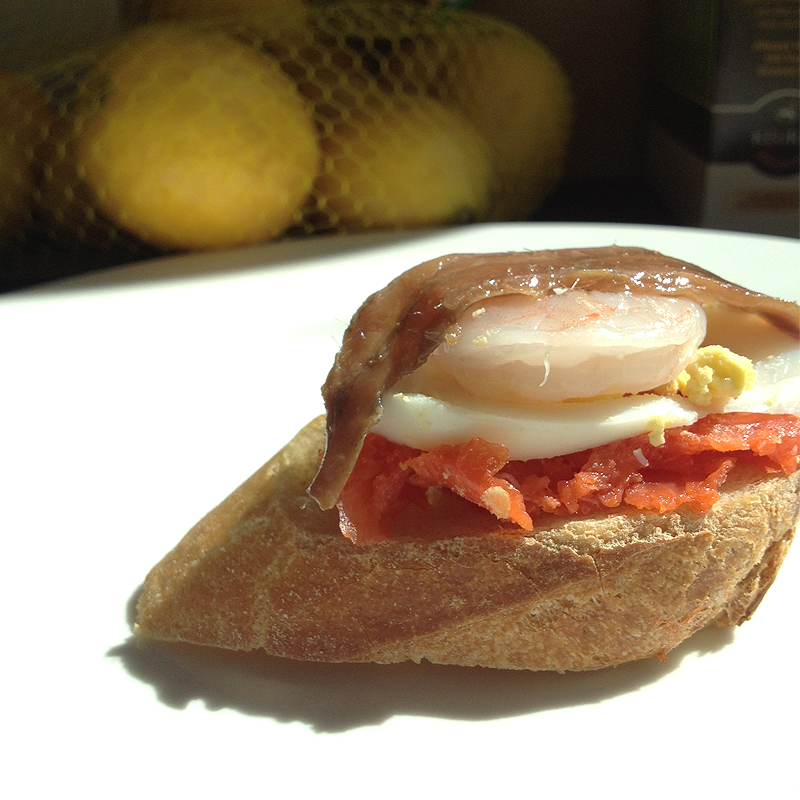 Spread lemon aioli on one side of the bread. 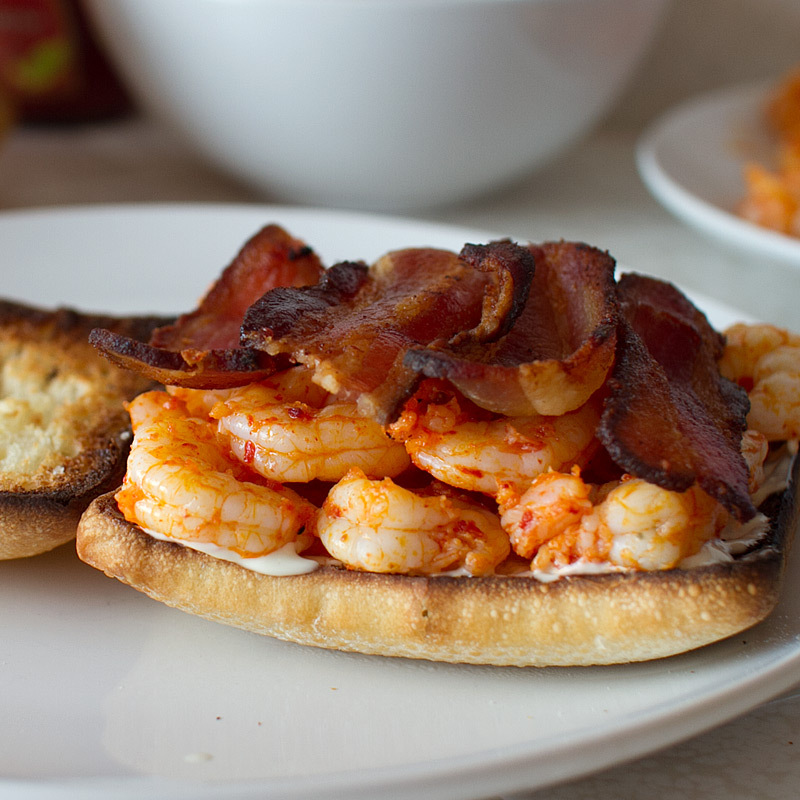 Top with 1/4 of the shrimp and two strips of bacon. Top with 1/4 of the arugula. On the other half of the bread, spread 1/4 of the avocado. Sprinkle with course sea salt and top the other half of the sandwich. Cut on the diagonal and enjoy!